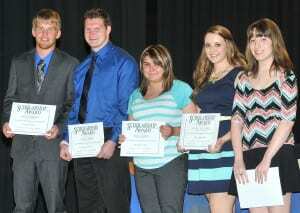 Recognized during last month’s Edon High School Academic Awards Night were its Alumni Association’s 2015 Scholarship recipients. Shown with their awards, from left, are: Heath Brown ($500 Scholarship), Lucas Price ($500 Scholarship), Taya Mason ($1,000 Scholarship), Alexis Mitchell ($1,000 Scholarship) and Karlin Munger ($1,000 Scholarship). The Edon Alumni Association Scholarship Fund, which typically provides four $1,000 scholarships each year to EHS graduating seniors, is funded by built-up scholarship reserves and generous donations from its alumni. Donations to the Scholarship Fund, in any amount, are gladly accepted throughout the year and can be forwarded to Esther Long Jewell, Edon Alumni Scholarship Fund Treasurer, PO Box 93, Edon OH 43518; each contribution will be set aside to be used entirely for future scholarships. Be the first to comment on "Edon Alumni Association Presents 2015 Annual Scholarship Recipients"